If you like your crime novels as thick as stew and as twisty as spaghetti, this tenth volume of the Tony Hill and Carol Jordan series will satisfy your appetite—with gravy and whipped cream on top. 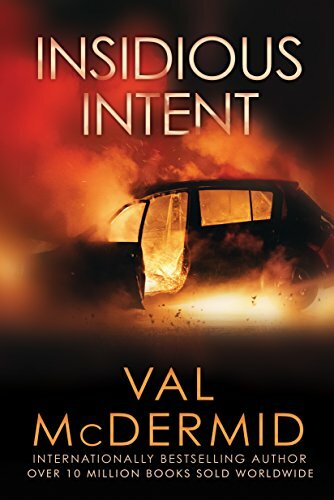 Author Val McDermid knows how to cook up such a feast, and loads this one with so much insidious intent that the book can’t possibly be otherwise titled. As well, she delivers such a shocker ending that she inserts an afterword asking readers to not let out the surprise and spoil other readers’ experience. Loyal fans who have followed the series will probably find it consistent with its predecessors and a logical extension of the characters’ tales. Readers new to the series with this volume will find enough backstory to understand who’s who and what’s what, though they might wonder why the lead characters spend so little time on stage. That’s because of the nature of the mystery. The plot part—chasing down a serial killer who’s expert at covering his tracks—must be served by police procedure. That requires characters outside the leads’ sphere to conduct interviews and move around the landscape to gather information. This honors verisimilitude; the leads can’t do all that work, so they assign it to others, giving readers the info they need to follow the plot and have a chance at guessing for themselves whodunit. The motive part—why the killer does it to whom, and what internal conflicts interfere with the characters’ ability to perform successfully—requires assorted scenes and point-of-view changes to properly set up the situation. As a result, the novel head-hops at every chapter change, ranging from Carol Jordan (recovering alcoholic who quit police work in disillusionment, only to be brought back to lead a new unit while concealing a terrible secret) and Tony Hill (a psychologist and profiler who rose to brilliance from a tortured past), to Carol’s support team doing the legwork (while sidetracked by their personal problems), along with the murderer and each of his victims, and even the everyday citizens who find the bodies. Their first case is likely to be their last if Carol and company fail to stop the killer. Just about every possible setback piles up against them. The effort of dealing with it all breaks Carol down. Tony extends himself too far to help her, he being already overextended from trying to enter the killer’s mentality to help find and stop him. Between Carol and Tony, we get to see love and duty and pride and guilt tear good people apart. So even though they’re off-stage a lot, the novel centers around their problems. Meanwhile, among the secondary characters, domestic or career dramas involve us in cybercrimes, ex-lover revenge, and the frustrations and rewards of police work. There is so much going on in the book, in fact, that it gets exhausting after a while, and resolution comes as a relief. There’s no question that the author—“Britain’s reigning Queen of Crime”—deserves the awards and accolades she has already won. Whether this new novel will count among them remains to be seen. But it’s certainly a candidate.